Let’s describe about www.onewebsearch.com, it is a adware program which provides the advertisement to you throw www.onewebsearch.com it does set as your home page and it doesn’t remove it easily. In order to get rid of onewebsearch.com you have to remove onewebsearch.com entries from registry as well. Here is the proper guide to remove www.onewebsearch.com, please follow the below instructions to get rid of www.onewebsearch.com, redirect, hijack, stop advertisement of onewebsearch. Click on Start button and then click on Control Panel and go to Add/Remove Programs(XP) or Program and Features. 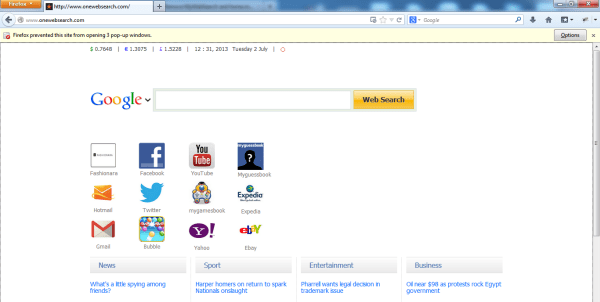 Now find out the Onewebsearch entry then Right click on it and then click on uninstall. Open Internet Explorer then go to Tools menu (press “alt” key once to active menu bar) and then click on Internet Option a configuration page will be opened, then click on General tab. Now look into under HOME PAGE Edit Box you got www.onewebsearch.com, replace it to www.google.com, then click on apply and close. Open Mozilla Firefox, Click on Tools menu (press “alt” key once to active menu bar) then go to Options, after that a configuration page will be opened, then click on General tab and then look on the very first section named as Startup. Under Startup you will see a HOME PAGE Edit Box, under this edit box you will see www.onewebsearch.com, please replace it to www.google.com, then click on apply and close. Now you will a configuration page with search option on the top, so please type “onewebsearch” into search bar, you will get the result. Q. How do i get rid of onewebsearch ? A. You are in the right page above you will get the solution. Q. I had the same problem how to delete onewebsearch home page ? A. Follow above instructions to get rid of this onewebsearch homepge completely. Q. Why my homepage set as onewebsearch ? A. onewebsearch is a adware program, that’s why. Q. Why it doesn’t allow me to change my homepage ? A. There is the same answer agian. onewebsearch is a adware which is set as your homepage and act like a virus act. Q. when i clicked on found searches it opens a different website, How do i solve it ? A. This is the redirection of the webpages and search results. please follow above instructions carefully, Remove onewebsearch.com, you definitely fix that issue.